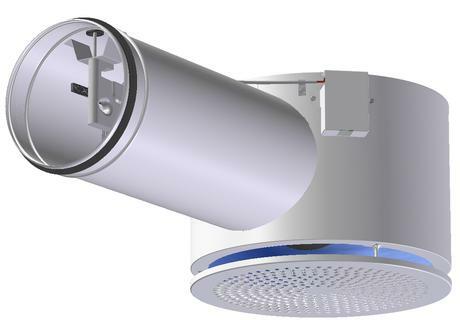 Tellus-LØV VAV is a circular supply diffuser for open installation with VAV function. It has excellent induction and is suitable for both constant and variable air flow rate. Tellus-LØV VAV is designed as a complete measurement and regulating unit for demand control of air flow in the ventilation system. The measuring station measures the differential pressure via a sensor integrated into the unit. The unit is equipped with a CHV-VAV-MP regulator from Belimo. The regulator specifications are provided in the table below. Tellus-LØV VAV has a removable front plate with LØV perforation. Tellus-LØV VAV is available in both high-profile and low-profile design. Tellus-LØV VAV has a galvanised steel finish. The damper is fitted with a polyester cloth. The spigot has an EPDM rubber gasket. Tellus-LØV VAV are delivered in RAL 9003 - gloss 30.